Faux Taxidermy Knits offers you 15 fabulously quirky and fun knitting patterns that tap into the massive trend for taxidermy inspired craft projects with an ironic twist! I came across Louise's patterns a while back and after Christmas I ordered the book along with a goody bag from Louise herself via Etsy. 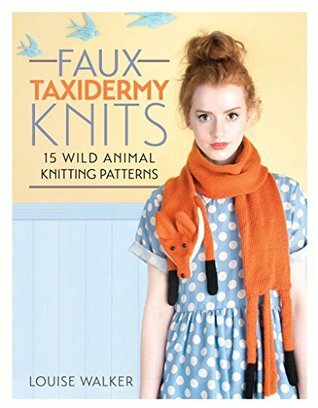 The goody bag included a signed copy of the book, knitting needles and the yarn and eyes needed to make the scarf on the cover. 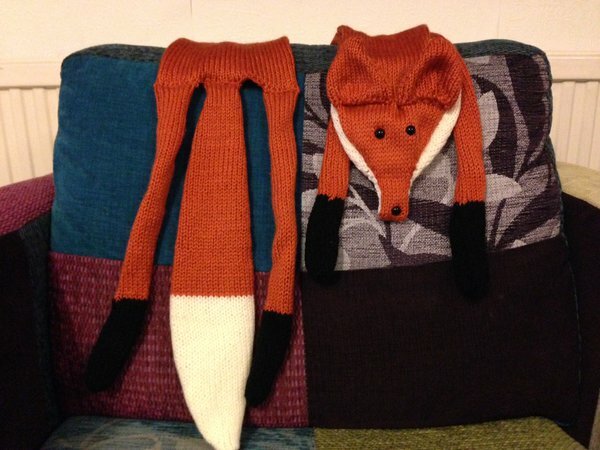 I started off immediately with having a go at the fox scarf. I've knitted for a while now and I found the pattern really easy to follow. At one point I did get worried that the wool that I'd been sent was going to run out before I'd finished but I was panicking needlessly. The body of the scarf was probably the worst bit. It seemed to take an age to get the 350+ rows done but once I got that done I seemed to speed through the rest of the pattern and finished it in just over two weeks. It was very much worth spending time blocking this until I did that it all kept curling up on itself but once I'd blocked it everything sat nicely. I've never bothered to block anything before but actually seeing the benefit of doing so with this means I'm more likely to get it a go another time. I really did enjoy making this pattern and can see me making a grey variant at some point in the not so distant future. As for the rest of the book. Some of them are a bit too dead animalesque for my tastes e.g moose head and the pheasants, especially when I live in the same house as a former vegetarian who really wouldn't appreciate them, but I cannot wait to get started on the owl tea cosy, the mole hill and paw mittens.